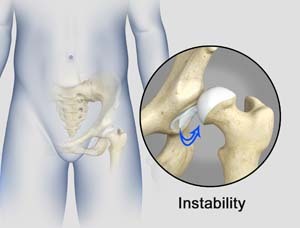 Your doctor will diagnosis hip instability based on your medical history and physical examination. Imaging studies such as plain X-rays, MRI, and MRI arthography (use of a contrast agent) may also be ordered to confirm instability. Your doctor may also perform hip instability tests such as a posterior impingement or dial test, both of which involve simple range of motion exercises. When conservative options fail to resolve your symptoms or if you have large fractures, you may be recommended to undergo surgical management. Surgery can be arthroscopic (minimally invasive) or open depending on your condition. Most of the common causes for hip instability, such as damage to the hip capsule and ligaments surrounding the joint, and labral tears can be rectified arthroscopically. Your doctor will be the best person to address your concerns and help you overcome your hip instability.